The KLIM Dakar Jacket has been a staple for dual-sport riders, racers and lightweight travelers since its initial release years ago. 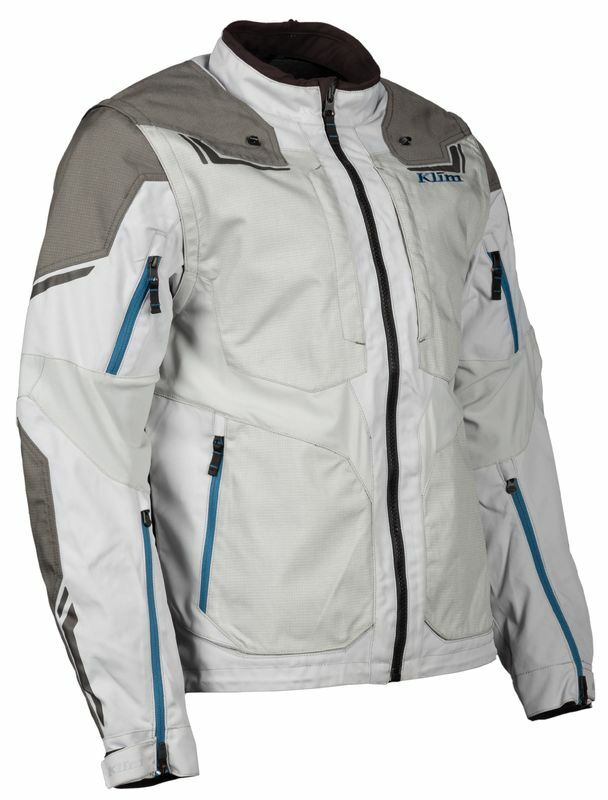 Now, KLIM has gone back to the drawing board and fully overhauled the jacket for this long-awaited redesign. They wanted more than just improvements over the previous version, the goal was comprehensive versatility with fewer compromises. They wanted a solution for multiple seasons of off-road and dual-sport riding, with protection for riders who want more than a jersey but not fulltime GORE-TEX. It started with material selection, and most of the fabrics in this new Dakar Jacket weren’t even available when the first version came out. Karbonite Micromesh stretch woven nylon makes up large parts of the chassis, offering excellent mobility and air permeability. The air permeability of Karbonite Micromesh allows more airflow than solid woven fabrics but less than fully open mesh, making it great for warm weather. Ripstop overlays for durability in key areas still exist, as do the zip-off sleeves and tail pouch storage space for when the temperatures peak. Greatly improved ventilation in the lower and upper sleeves, in addition to the Karbonite Micromesh panels, gives riders far more tunable options between fully closed sleeves and the sleeveless vest. The whole jacket is significantly lighter and more flexible, offering enduro riders excellent mobility for the trails without compromising protection for fast open sections and the pavement. Of course, for cold temperatures and extended rain, a KLIM Stowaway or Traverse overshell would complete the kit and create a waterproof, windproof barrier from the elements. The whole armor pocket system for optional D3O armor has been upgraded. Pockets now hold armor in the shoulders as well, and they remain with the sleeves when you remove them. This now gives riders the option for a fully D3O armored non-GORE-TEX jacket if they choose. However, it’s still tailored to fit over an off-road armor suit and the armor pockets remain low profile when not in use. Instead of the traditional 3M™ Scotchlite™ Reflective Material, the Dakar Jacket features 3M™ Scotchlite™ C790 Carbon Black Reflective. This reflective material offers a black low-profile appearance until illuminated, adding safety when needed but maintaining clean looks otherwise. The reflective material also stretches and resists cracking, so it’s perfectly suited for dynamic off-road riding. The new Dakar Jacket ends up being fantastically versatile, creating a link between trails and pavement without the compromises of light jerseys or full GORE-TEX. KLIM engineered the Dakar Jacket with rider focused functionality that inspires confidence at 100 mph through the desert, or crawling up nasty singletrack. It’s ruthlessly rugged and built to dominate any terrain. KLIM Technical Riding Gear is a global leader in designing, developing, sourcing and distributing the most advanced powersports apparel for snowmobile, motorcycle and off-road riding. Utilizing the world’s most premium technologies in waterproof, breathable, durable and comfortable materials, KLIM offers gear for the most demanding riders. Driven by the continual feedback and input from dedicated test pilots and passionate customers, KLIM strives to do one thing above all – enhance the riding experience. For more information, visit www.KLIM.com.